Once again we left at 8:30, did the easy 45 minute drive to Cluses, fitted the snow chains in under 10 minutse, then drove 25 minutes up the hill to the free car park at Vernant, there was plenty of parking space available. There was no queuing for tickets, plenty of people in the sales office and the friendly lift attendant explained that a safety leash was required at all times. There are a number of ticket options depending on whether you want to cover just Flaine Sector, Everything except Flaine (Massive Sector) or the Whole Domain (Grand Massif). I paid 33.50 Euros for the "Massive Sector" and opted for the convenience of an RFID card over the traditional paper ticket with a magnetic stripe. Note: the RFID card can be topped up on-line and means that you don't have to dip into your pockets whilst manoeuvring a skibike through the turnstile. The sky was lightly clouded with visibility reducing during the day, it was better at low altitudes with very low visibility up on the peaks. There wasn't much wind but there was some light snow precipitation which steadily increased through the day. I started by using Le Lac chair, to access the Arolle run for a warm up; it had some up-hill sections and some quite flat sections, so you needed to maintain a good speed or get off and push. Next was the Corblanche chair, my first experience of a "tapis" moving carpet chairlift system, it is tricky to keep your balance on 60cm skis whilst cradling a 10kg skibike in your arms. Returning via the Silice and Dolomie runs I encountered quite crowded conditions and it was unexpectedly steep and mogulled in places. The charming Portets run through the trees was easy, uncrowded and flattering. From there I took the super long Les Molliets chair lift back up to the top then came back down the Molliachets and Marmottes runs back to its base. All ideal skibike territory; sublime blue runs, through the forest, with easy variable gradients, a few steeper sections and some moguls. L'Airon, a very quick 2 seater chair lift took me to the Tetes des Saix. By following the Silice and Dolomie runs, now becoming difficult due to very flat and low light at this point, over to the Vernant chair, I had access to the long Tourmaline run down into Flaine itself. This is on the limit of the Secteur Massif pass, so my only option was to return via the Grand Vans chairlift, by then the crest had very poor visibility with driving snow, so I descended gingerly down to the Vernant car park at the end of the day.This area proved to have considerable promise for the skibiker, lots of variety and scope for exploration and touring. It was quite crowded at times with the design of the pistes funnelling together snow users from different areas into bottlenecks. There were absolutely no issues with the lift system attendants, all staff were polite and helpful. 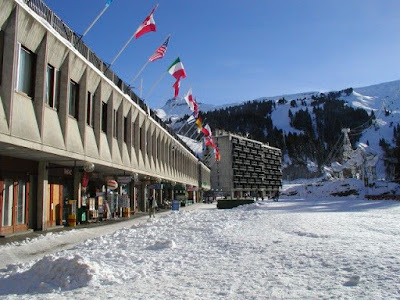 I intend to return later and explore the Flaine area more, anyone care to join me?